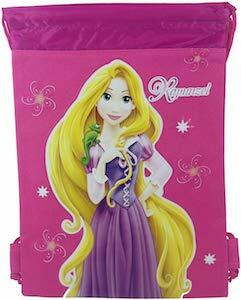 Now people that want a fun bag and like princesses can get this Rapunzel drawstring bag. The Princess bag is available in two versions one is a dark pink (on the picture) and one is a light pink and both show Princess Rapunzel from the Tangled movie but they do have a different design so click on the picture to see both. The Rapunzel bag is 10 z 14 inches and has one drawstring and that makes it into the perfect bag for the kids to carry around their stuff. A Disney Princess is loved by kids and adults and having a drawstring bag with a Princess on it is one way to show your love. If you wonder what kinds of jewelry Rapunzel uses then I tell you that she probably wears these Tangled Pascal earrings. Now you can have a chameleon in your ear and it will even looks like it is crawling through your ear as these are faux tunnel earrings. The earrings look like Pascal the famous green chameleon that we all know from the Tangle movie. The chameleon earrings are green with a metal centre that fits in your ear. It will be so fun to see Pascal in your ears like it belongs there. Cute jewelry is something we all need and having this in your ears is fun and cute. 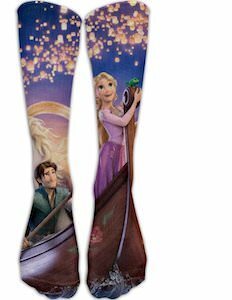 If you like the Tangled movie and would like some fun socks then you should check these Rapunzel and Flynn knee socks. The socks together show the scene with Rapunzel and Flynn in the boat and yes Pascal the chameleon is there too. These women’s socks are knee socks are made from 78% cotton, 20% nylon, and 2% spandex. So now you can wear some amazing socks and feel like a princess because you are wearing one on your feet and fun socks like this work great under shorts, skirt or dress but even under jeans they work because you still know that you are wearing a Disney Princess on your feet. 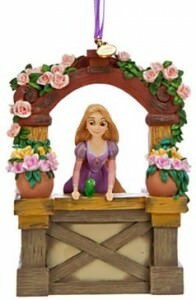 Now you can have your own Rapunzel figurine as that should be part of every Disney collection. 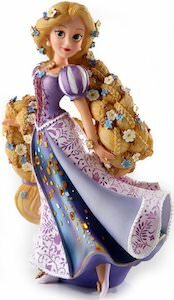 The figurine of Rapunzel is highly detailed and she really is showing off the amazing dress she is wearing and her hair is decorated with flowers. The Rapunzel figurine is made from stone resin and is 9 inches tall and it looks like she just walked out of the Tangled movie. Everything you want is there complete with shoes and an amazing look and that means that this should be part of you Disney collection. Now there are Rapunzel leggings for women that would love to have this Disney Princess on their legs. The leggings have a pink background with some Disney details on it and on top of that background, you will find Rapunzel just like we have seen her in the Tangled movie. Rapunzel covers most of the right leg while her hair flows to the left leg. You can get these Tangled leggings in women’s sizes XSmall – XL and they are made from 88% polyester and 12% spandex so that they feel great and have enough stretch if you like them form fitting. The magical world of Disney now can be constructed by yourself with the classic and fun LEGO blocks. If you love Disney’s Tangled then check out this LEGO set. 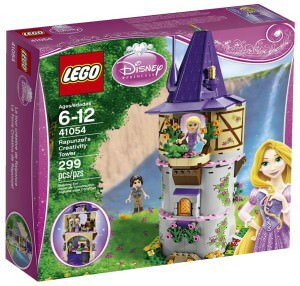 This LEGO set is based after Rapunzel’s tower from the great Disney animated movie Tangled. Find all the pieces to put together the tower along with many different accessories from a full kitchen, hidden stair case, fireplace, mirror, chair, frying pan, tiara and so much more. Not only do you get all of these accessories you will also get 2 LEGO mini figures of Rapunzel and Flynn Rider as well as Pascal the chameleon. The Rapunzel’s tower is the LEGO set number of 41054 and when put together it measures over 12 inches high x 4 inches wide x 4 inches deep. Now there is a Rapunzel lunch box that is just what you or your child needs. This lunch box made by Yubo shows on the front and back a nice image of Princess Rapunzel just like we know her from the Tangled movie. 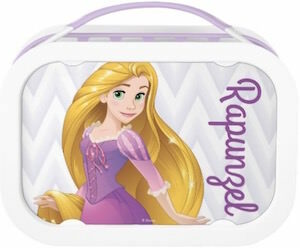 Besides the princess, it says “Rapunzel” on the picture but there it can have your name (at no extra cost) and that makes this a fun personalized lunch box every kid and adult will like. Inside the lunch box, you will find an icepack, sandwich box, and two snack boxes and all that can be washed in the dishwasher. This is a Rapunzel water bottle and that is what every Disney Princess fan needs. The stainless steel bottle comes in many fun colors and has a picture of Rapunzel and all her hair on it just like you seen it in the movie Tangled. Made from 18/8 stainless steel this bottle is 100% BPA free, lightweight, crack proof and of course spill proof to. And the threaded lid of the Rapunzel bottle is great for attaching it to a bag so that you always have it handy even if you have no room inside your school backpack. One of Disney’s most popular princesses is Princess Rapunzel from the movie Tangled. You can add this adorable Sketchbook ornament to your collection and show it off this holiday season or leave it on display year round. This 4 1/2″ x 3″ x 2 1/4″ resin ornament shows Rapunzel at the tower window in her lavender dress, surrounded by pink, peach and yellow roses, with her only friend, the quirky chameleon Pascal. This fully sculpted ornament is hand painted and can be hung on your tree or left standing on your mantle and there is a button on the bottom to turn on and off the Mandy Moore song “When Will My Life Begin”. And the batteries are included! All the girls want to be a princess once in their lives and now there are princess worthy slippers to keep their feet warm. These purple and pink slippers shows princess Rapunzel on the front surrounded by flowers. A princess that likes to dance and play will be so happy to have these fun Disney slippers that have a non slip sole and padded footbed. 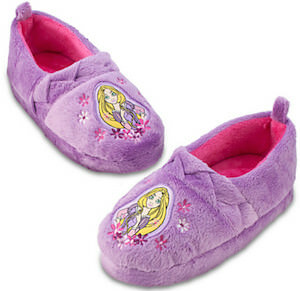 And these Princess Rapunzel slippers come in kids sizes 2 – 13. Sorry grown up ladies these slippers are just for the little princesses that like to play and do not mind if they forgot socks and footwear so with these slippers they will never forget to wear some slippers.